Soviet cosmonaut Valentina Tereshkova became the first woman to fly to space when she launched on the Vostok 6 mission June 16, 1963. Valentina Tereshkova was the first woman to go into space. In 1963, she spent almost three days in space and orbited Earth 48 times in her space capsule, Vostok 6. That was her only trip into space. Tereshkova later toured the world to promote Soviet science and became involved in Soviet politics. Valentina Vladimirovna "Valya" Tereshkova was born on March 6, 1937, in Maslennikovo, a village near the Volga River about 170 miles (277 kilometers) northeast of Moscow. Her parents worked on a collective farm, and her father was killed during World War II. Valentina left school when she was 16 and worked at a textile factory, but continued her education through correspondence courses, according to the Smithsonian Air and Space Museum. Tereshkova joined the factory's Young Communist League (Komsomol) and soon advanced to the Communist Party. She became interested in parachute jumping after joining the Yaroslavl Air Sports Club. After Yuri Gagarin became the first man in space in 1961, Tereshkova volunteered for the Soviet space program. Although she did not have any experience as a pilot, she was accepted into the program because of her 126 parachute jumps. At the time, cosmonauts had to parachute from their capsules seconds before they hit the ground on returning to Earth. Along with four other women, Tereshkova received 18 months of training, which included tests to determine how she would react to long periods of time being alone, to extreme gravity conditions and to zero-gravity conditions. Of the five women, only Tereshkova went into space. 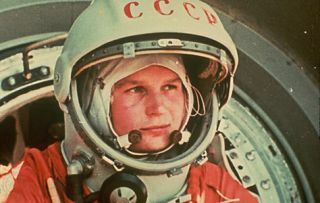 Tereshkova was chosen to pilot Vostok 6. It was to be a dual mission. Cosmonaut Valeriy Bykovsky launched on Vostok 5 on June 14, 1963. Two days later, Tereshkova launched. The two spacecraft took different orbits and came within 3 miles (5 km) of each other. The cosmonauts exchanged communications. Tereshkova logged more than 70 hours in space and made 48 orbits of Earth. Soviet and European TV viewers saw her smiling face and her logbook floating in front of her. They did not realize that the flight almost turned into tragedy, a fact that was classified for about 40 years. An error in the spacecraft's automatic navigation software caused the ship to move away from Earth, according to the RT news channel. Tereshkova noticed this and Soviet scientists quickly developed a new landing algorithm. Tereshkova landed safely but received a bruise on her face. She landed in the Altay region near today's Kazakhstan-Mongolia-China border. Villagers helped Tereshkova out of her spacesuit and asked her to join them for dinner. She accepted, and was later reprimanded for violating the rules and not undergoing medical tests first. However, Tereshkova was honored with the title Hero of the Soviet Union. She received the Order of Lenin and the Gold Star Medal. She became a spokesperson for the Soviet Union and while fulfilling this role, she received the United Nations Gold Medal of Peace. Tereshkova never flew in space again. She later became a test pilot and instructor and earned a doctorate in technical sciences. On Nov. 3, 1963, Tereshkova married fellow cosmonaut Andriyan Nikolayev. Their first child, a daughter named Elena, was a subject of medical interest because she was the first child born to parents who had both been exposed to space. Elena later went on to become a medical doctor. Tereshkova and Nikolayev divorced in 1980. Valentina Tereshkova turned 76 on March 6, 2013. In 1982, Tereshkova married Yuliy Shaposhnikov, a surgeon. She later was a deputy to the Supreme Soviet, then a people's deputy. She was also a member of the Supreme Soviet Presidium and also served on and later became head of the Soviet Women's Committee. She also was head of the International Cultural and Friendship Union and later was chairperson of the Russian Association of International Cooperation. Tereshkova remains active in the space community, and her legacy is widely celebrated in everything from books to museums to stage productions. In 2017, London's Science Museum opened a temporary exhibit called "Valentina Tereshkova: First Woman in Space," which celebrated her contributions through artifacts as well as photographs. That same year, stage director and producer Valentina Fratti — who was named after Tereshkova — released the off-Broadway play "They Promised Her the Moon." The production looked at the early life of Jerrie Cobb, an American pilot who later became famous because she was the "almost-first" woman in space. Another 2017-18 play by Chicago's Theater Unspeakable, "Moonshot," included Tereshkova as one of the characters. The BBC aired a documentary in 2014 called "Cosmonauts: How Russia Won the Space Race," which summarizes the early space race from the Soviet perspective — a difficult accomplishment until recent years, as many of the documents were secret. It later was available on PBS in 2016. "They forbade me from flying, despite all my protests and arguments. After being once in space, I was keen to go back there. But it didn't happen."